It Came From the Workshop: Prototyping and Making Designer Art Clocks: "When you have something working, you are 15% done and the fun part is over." Prototyping and Making Designer Art Clocks: "When you have something working, you are 15% done and the fun part is over." UPDATE: My brother (the designer) and I have launched a Kickstarter crowdfunding campaign to do a production run of these clocks! UPDATE: It was not only successful, but all rewards successfully shipped on time! My brother designed this unique and interesting clock. The seemingly abstract shapes become well-defined numbers as time passes. For example, you can see the "4" above. Time lapse showing about 2 to 4 o'clock. No motion is visible to the naked eye in real time. Interest in the clocks started almost as soon as the first one was made. However, an efficient way to build them was still lacking. That's where I came in. The first small production run was done with laser-cut acrylic pieces and hand-glued symbols and lines. It was a nightmare. Fingerprints, difficulties aligning things, glue where glue shouldn't go, bottlenecks in time due to having to glue something then set it aside (in a place that won't get dust!) while it cured before you could work on it again, and so on. It was a long, manual process that was full of risk - one screwup in the entire long process meant a clock was ruined. A nightmare, but also a learning experience. Many prototypes came afterwards to refine the building and assembly process. It's a good example of the difference between functional prototypes (how something will work) versus manufacturing prototypes (how something will be made). So much can go wrong at so many points! An otherwise perfect process can be unusable because a smudge or nick or marring is unavoidable side effect, so it's back to the drawing board. Amanda Wozniak really knew what she was talking about when she said "When you have something working, you are 15% done and the fun part is over." But finally I have a workable process with only fine-tuning left to do. There are no more unknowns, just final details! 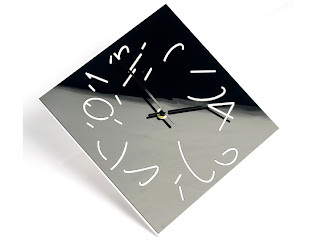 For the dial (the clock's "face") I use a plastic that has two layers - black on top of white. The black is worn away by a laser (in a process very much like laser eye surgery) to expose white in select areas only. This leaves a sharp, clearly defined pattern that looks great. But that is only part of it - the process of keeping it clean during manufacture is the rest of the work! All that black dust wants to go somewhere. And it is very attracted to the freshly-exposed pure white, which stains it. Details, details, details... Sooner or later, everything will matter. Making more than one? Your design will change. Making just one of something isn't too much trouble. But to better appreciate the things that matter when you get into manufacturing, try making only ten of something and you'll be surprised at the kinds of bottlenecks that exist. Just keep a pen and paper handy when you do, because you'll wind up with a heck of a "to-do" list for refining your design! September 10, 2013: My brother and I launched a Kickstarter campaign to fund the first production run of these clocks. Available only on Kickstarter, we are offering assemble-it-yourself KIT versions of the clocks for those of your with DIY spirit! December 4, 2013: All rewards for our successful campaign shipped on time! We aimed to be done before Christmas, and - thanks to careful planning and experience - we were!